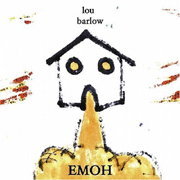 One of indie-rock's most prolific singer-songwriters, Lou Barlow, known as the mastermind behind Folk Implosion and Sebadoh, both of which have seem to finally been put to sleep, unveils his new direction on his Merge Records debut, Emoh. Whereas Sebadoh and Folk Implosion were previously Barlow's studio bands he took on the road, and his lo-fi home recordings were his chance to throw production and expectations out the window and just do whatever the heck he pleased. On Emoh Barlow brings the two worlds together, offering up a focused, more cohesive, and stronger produced collection of songs with Emoh. Barlow purists may shudder at the thought of a produced, glossy collection of Barlow songs. And, those people need not worry. Barlow doesn't take it too far. Just allowing enough production and hi-fi, if you will, on his otherwise lo-fi outputs to ensure they have a broader appeal, a stronger sound, and are more fully realized (some of Barlow's previous solo offerings have offered songs that were more glimpses than finished). With fourteen tracks to play around with, Barlow spans the gamut, as usual, from nice vocal harmonies embedded in beautiful pop to off-the-beaten path indie-rock with his trademark lyricism and pop knack. Though, it is guaranteed, whatever he does, he always puts his heart and soul into every bit, ensuring that the entire collection of Emoh is both powerful, even when the song is quiet and timid, and captivating, something that Barlow excels at. I'll give it an A-.